It seems like no one has been talking about Bitcoin, at least for quite a while. That is what happens when the price of a seemingly magical currency plummets from a high of $1,242 in December, 2013 to a mere $238 as I write this, a drop of 81%. That means the total Bitcoin market cap is about $3.4 billion — far more than perhaps many expected even a few years ago, but a tiny number in the grand scheme of things (for the sake of comparison, Apple sold $3.9 billion worth of iPhones every week last holiday quarter). Indeed. Perhaps the single biggest obstacle facing Bitcoin is that most folks don’t really understand exactly what it is, or why it’s so interesting. Using cryptographic keys, I can convey to you X amount of Bitcoin (fractions or multiples). This is cool because I’m transferring something digitally — no real-world analog (and associated clearinghouse, like a bank) required. Our transaction is submitted to a global peer-to-peer network, which verifies the transaction and enters it into a public record (the blockchain). Because the blockchain is a ledger of every Bitcoin ever made, any one Bitcoin, or fraction thereof, can only ever be owned by one person. This is cool because it prevents me from double-spending — transferring something multiple times. In other words, Bitcoin makes digital goods rivalrous — uncopyable. That global peer-to-peer network isn’t verifying transactions out of the goodness of its heart; rather, you may know of this verification process by a different name: mining. About every ten minutes one of the verifying computers is awarded with 25 Bitcoins for its effort (a current value of $5,950). This is cool because it means Bitcoin is a self-supporting system: transactions are verified with absolute certainty for free. Note that only the third bullet point really seems to have anything to do with money: what is most exciting about Bitcoin, at least from my perspective, are the first two points — that Bitcoin specifically, and the applications enabled by the Blockchain broadly, are digital (with all its attendant advantages, including worldwide instantaneous transferability, divisibility, tracking, etc.) yet scarce — in stark contrast to everything on the Internet that can be copied at no cost, much to the detriment of content producers in particular. This means Bitcoin could theoretically be used for all sorts of transactions, including messages, contracts, identity verification, etc., and, of course, monetary ones, where today’s digital applications just don’t work. It is monetary transactions that dominate discussion of Bitcoin, not only because that application is the easiest to understand, but also because money is the driving force behind mining. While mining first took place on personal PCs, the fact it is an embarrassingly parallel computational problem meant it was well-suited to graphics cards. Soon, though, as the price of Bitcoin increased, miners began investing in Application-Specific Integrated Circuits (ASIC), chips custom-built for Bitcoin and placing them in data-centers wherever electricity was cheap. While ASICs represent the fixed cost of Bitcoin mining, the expense of electricity is the marginal cost; indeed, Bitcoin is, for all intents and purposes, the digital representation of electricity. This presents a downside of Bitcoin — it is “free” in part because many of the externalities of its production are borne by society broadly in the form of pollution — but also highlights that even when it comes to mining money is only tangential. Were Bitcoin to go to $1 the vast majority of miners in the world would stop production tomorrow, yet Bitcoin the protocol would continue, automatically changing the difficulty of its algorithm to keep up the same steady pace of transaction verification on whatever processing was available to the network. Let me be explicit on this point: Bitcoin inherently has nothing to do with money, all of its representations as a digital currency to the contrary. Rather, it is a protocol that enables rivalrous (non-copyable) digital goods. 21 is now officially open for business — and business development. After much hard work, we’ve created an embeddable mining chip which we call the BitShare that comes in a variety of form factors. The 21 BitShare can be embedded into an internet-connected device as a standalone chip or integrated into an existing chipset as a block of IP to generate a continuous stream of digital currency for use in a wide variety of applications. You can request a dev kit by signing up on our website to get started. 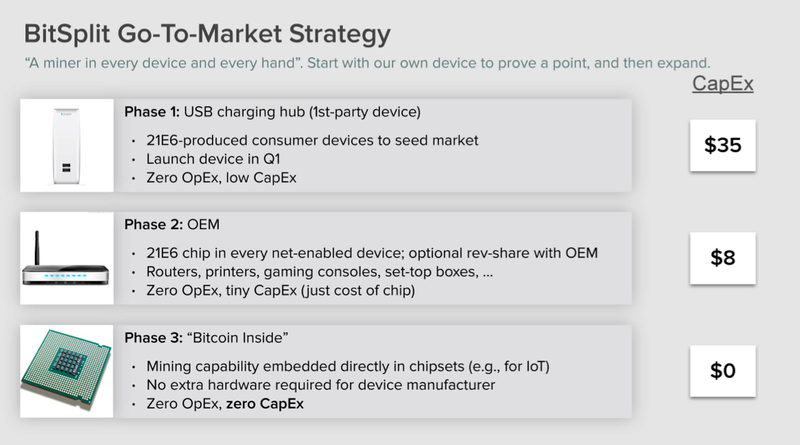 That’s right, with the BitShare chip, your Internet-of-Things toaster can mine Bitcoin, along with your cell-phone, and your refrigerator, and, well, your USB charger, which 21 Inc. is starting with.2 Srinivasan lists a whole hosts of potential benefits from this “free” revenue stream, including micropayments from a “free” revenue source,3 subsidized devices, even subsidized chips with 21 Inc. IP. Indeed, it makes far, far more sense for consumers to simply buy Bitcoin that has been harvested by the sort of industrial mining operations I talked about above on the open market. Indeed, all the benefits of Bitcoin are right now mostly theoretical: making it real requires a massive journey from here to there, to a world where everyone uses Bitcoin just as they use the Internet, and I think 21 Inc. is best understood as a massive bridge-building project from today’s speculative curiosity to tomorrow’s essential trust network. When 21 Inc. first began in 2013, it was as a traditional mining operation: they brought on chip designers and built at least two generations of mining chips, earning 5,700 Bitcoins in 2013, and 69,000 Bitcoins in 2014. While it’s possible the company is pivoting to BitShare chips, I don’t think so; rather, 21 Inc.’s traditional mining pool gives it flexibility in making Srinivasan’s promises a reality. The company will actually have sufficient Bitcoin to guarantee an OEM that they will get a certain return for having placed a BitShare chip in the hardware they build, long before 21 Inc. achieves the sort of scale necessary to even fantasize about meaningful returns. 21 Inc. could also ensure consumers are compensated for the electricity they use, although I’m a bit skeptical about this — I think the play is primarily focused on getting manufacturers on board and hoping that future scale eventually ensures consumers get their fair share. That may be dubious ethically, but the payoff could be huge: the dynamics of Bitcoin and its application for a variety of trusted transfers shifts tremendously when everyone has multiple hardware-based digital wallets — whether they know it or not! For example, if your phone has a hardware-based digital wallet, applications for trusted messaging or contract signing or a whole host of applications no one has yet thought of become approachable not only for those capable of setting up a Bitcoin wallet but also those able to simply download an app. Identification depends not on usernames or passwords but on unique digital signatures. The possibilities are endless, and, I think, good — and they only rely on a single Satoshi (0.00000001 Bitcoin, the smallest amount that can be transferred). This is what I think Srinivasan means when he says “we are less concerned with bitcoin as a financial instrument and more interested in bitcoin as a protocol” and that “embedded mining will ultimately establish bitcoin as a fundamental system resource on par with CPU, bandwidth, hard drive space, and RAM.” It turns out lots of people are willing to spend electricity for essential functionality: nearly all of us run routers 24/7, whether we are using them or not, because instant access to the Internet is worth the electrical cost. A more extreme example are DVRs: our set-top boxes are the biggest power drains in our houses, costing $3 billion annually in electricity in the U.S. alone — nearly the entire worth of Bitcoin! — all in the service of making watching TV just a little bit more convenient. Why wouldn’t we eventually be ok with using just a bit of electricity not for profit but for mining the Satoshis we need to use an entirely new class of apps? Best keep an eye on your mailbox — and electricity meter.